This simple subtraction dice game helps students practice subtraction facts (difficulty depends on the type of dice used), comparing 2 numbers (more / less) and counting by 5 to add. 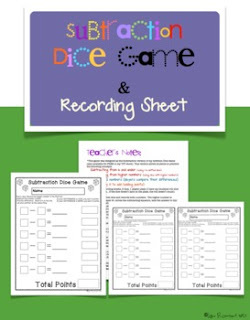 The game involves 2 players rolling 2 dice, recording the numbers, finding the difference, comparing differences (awarding points for the difference that is lower) and finally, adding up the points by using counting by 5 to get the total. Each player can use a full page recording sheet OR use the 1/2 size (2 sheets on one page). I hope you enjoy the FREEBIE! *note: The addition version of this game is also available for FREE (found in my FREEBIE category).